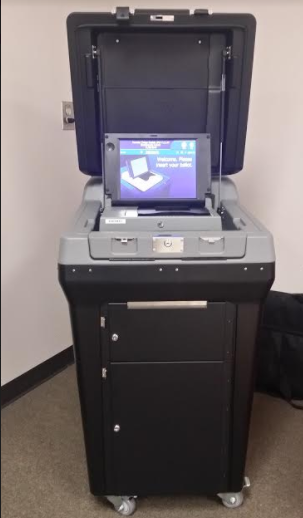 (APN) ATLANTA — On January 10, 2019, the Secure, Accessible & Fair Election (SAFE) Commission–created by then-Secretary of State (SOS), Brian Kemp–issued its recommendations, including a recommendation that Georgia move to a new E-voting system that includes a paper trail of persons’ votes that could be used in a recount. The SAFE Commission is made up of legislators, election officials, representatives from political parties, one cybersecurity expert, and voters. The Commission submitted its recommendations to the Georgia General Assembly, which is expected to take up E-voting legislation this year. The eight recommendations include touchscreen, Ballot-Marking Devices (BMD); a paper trail; a statewide uniform voting system; funds for training and education of election officials and voters; and voting methods for disabled persons. The Commission voted thirteen to three to approve the recommendations. The three dissenting votes came from State Rep. James Beverly (D-Macon), State Sen. Lester Jackson (D-Savannah), and Georgia Tech cyber security expert Wenke Lee. However, cybersecurity experts and computer scientists from across the country warned the SAFE Commission that the only secure voting system is hand-marked paper ballots, and not computer voting on Ballot Marking Devices (BMD’s) with barcodes. But the SAFE Commission has recommended what the vendors are selling: BMD’s. “From a cybersecurity standpoint, there is no difference between the touchscreen BMD favored by Brian Kemp and the paperless touchscreen DRE’s that Georgia currently uses,” Richard DeMillo, Computer Scientist, Georgia Tech tells APN. Georgia is currently using Direct Recording Electronic (DRE) voting machines, which create no paper trail. BMD’s record votes in a barcode, which are not human readable marks; therefore, voters cannot verify their choices in the barcode, but it is the barcode that the State of Georgia would use to tally election results. Barcodes can be manipulated to flip votes. “In a compromised system, the reader might print the correct ballot choices, but flip votes in the barcode,” DeMillo said. As previously reported by Atlanta Progressive News, Georgia’s aging DRE’s have had multiple election security breaches and have been the subject of multiple lawsuits in court over those vulnerabilities. Voters in Georgia currently have no way to know if their votes are counted correctly or if they match the computer tallies, without a verifiable paper audit trail, which Georgia has not had since 2002. Lee in his security requirement letter to the SAFE Commission recommends that the safest and most secure approach is hand marked paper ballots. The link below is his letter. “It is meaningless to perform a post-election audit on printouts that cannot be guaranteed to be valid in the first place; the audit would just be “garbage-in, garbage-out,” and perhaps worse, give a false sense of accuracy or legitimacy of the election results,” Lee cautioned the SAFE Commission. Lee and DeMillo are not the only experts to warn the SAFE Commission about the BMD’s barcode vulnerabilities. SAFE received numerous letters from computer scientists and cyber security experts that warn BMD’s barcodes are not human readable marks and can be compromised to flip votes in the bar code that the scanner counts in the tallies. A letter from 24 cybersecurity experts from around the country alerts the SAFE Commision that “BMD’s share the pervasive security vulnerabilities found in all electronic voting systems, including the insecure, paperless DRE’s in current use statewide” (in Georgia). “No method of balloting is perfect, but vulnerabilities in computerized marking devices, if exploited by hackers or unchecked by bad systems designs, raise the specter of large-scale, jurisdiction-wide failures that change election outcomes,” the letter says. Instead, with hand-marked paper ballots, voters are responsible only for their own mistakes and won’t change the outcome of an election the way that BMD’s can if hacked. The National Election Defense Coalition also sent a letter to the SAFE commission stating that BMD’s are unnecessarily costly and less efficient. Estimates range from an initial cost of 100 to 150 million dollars for the proposed new computer voting BMD machines. But with maintenance and other costs it could eventually skyrocket up to almost one half billion dollars, Sara Henderson, Executive Director of Common Cause Georgia, reports. “A hand-marked paper ballot is the only kind of record not vulnerable to software errors, configuration errors, or hacking,” Verified Voting said in an additional letter. With all this information available, the legislature is posed to adopt for Georgia the use of BMD’s with barcodes. “The State has proven over and over again that it is ill-equipped to understand and administer complicated computerized system in a secure way, and there has been no interest in making the investments required to upgrade cyber security,” DeMillo tells APN in an interview. Raising further concerns, now-Governor Brian Kemp has hired Charles Harper–a lobbyist for Election Systems and Software (ES&S)–as his Deputy Chief of Staff. Some people see Harper’s hiring as cronyism and a conflict of interest. “The appointment certainly suggests a level of coziness between the Governor and a vendor trying to sell an outrageously expensive and un-auditable voting system,” Marilyn Marks, Vice President of the Coalition of Good Governance, tells APN. The New Yorker magazine published an article about how ES&S routinely wined and dined state election brass with trips, upscale hotel accommodations, and tickets to live events. Georgians Kathy Rogers, David Dove, and Charles Harper are mentioned in the article. “There are qualified vendors who have this technology who demonstrated relevant products to the commission in August and again on January 03,” he said.